This beautiful handmade multi use bowl will look lovely in your bathroom for your feel good look good sessions. Portion out your bath salts, hand soaks, oils and more. It would also make a great gift. It is currently on sale for 10% off. Use code ETSY10. My name is Jo and I am a UK based mum of three teenagers – well four if I include my hubby! & two dogs. I live in a small village in the East Sussex countryside and life is generally quite chaotic! 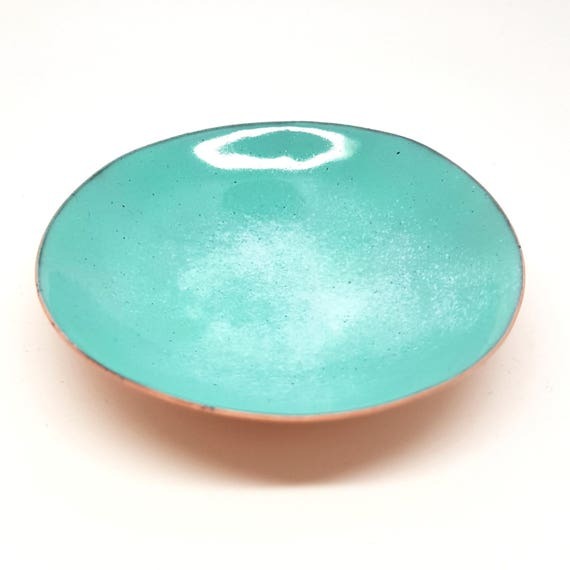 I love the idea that an art form as old as enameling can be used in this day and age to create modern pieces of jewellery. I am completely self taught and learn through a lot of books and online videos and forums. My aim is to bring a little colour into the lives colourful people by creating wearable, affordable and contemporary jewellery for modern and unique women and men. Why is the store called Maisy Plum? Jo: HaHa! I get asked that a lot. My daughter is Maisy and I call her a plum sometimes… kind of works! LOL. What is your main form of relaxation? Jo: Weirdly it’s exercise… I do something everyday or walk my dogs. If you were a biscuit which would you be and why? Jo: I’d be a jammy dodger – hard on the outside and soft on the inside!